I am taking the plunge into the unknown a bit this week - promoting a book with free promotional downloads via Kindle. its NZ Book Month, so the launch is timely. This book can be downloaded free of charge from Kindle.com. Note, the Kindle app is available for people who don’t own the Kindle device, so books can be viewed on your pc, ipad, iphone or tablet. Set in coastal New Zealand, this book tells the story of media changes against a back drop of social and economic changes facing small towns the world over. When the mayor of his small town is found dead in a drain, reluctant reporter Bill Brown is drawn in to chase down the biggest ever story in Coastlands for his family-owned newspaper. Bill would rather go surfing, drink coffee and flirt with the mysterious Angelique, anything rather working on The Last Newspaper in the World. Bill's easy life is about to change, as the death propels him to take his work, and life, more seriously as he is thrown into the murder investigation. 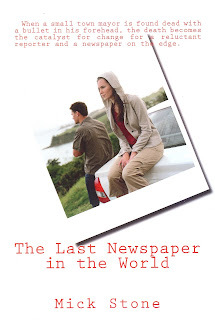 Besides being a murder mystery with a twist, the story is set against the backdrop of diminishing demand for news on paper and pressures from mega-media groups, highlighting the new hazards and challenges facing journalists in the 21st Century. WHEN: The period for downloading the book runs from 5 March 2013-7 March 2013. (see note below for exact timing for your region. 1. Free promotions will start at approximately 12:00 AM Pacific Standard Time on the date specified. Depending on system latencies, it may take a few minutes to several hours for the free promotion to start. 2. Free promotions will end at approximately 11:59 PM Pacific Standard Time on the date specified. Depending on system latencies, it may take a few minutes to several hours for the free promotion to end. If you wish to obtain a hard copy of the book you may contact BMS Books directly or go to Amazon or book suppliers such as Wheelers Books and Total Library Services.